When is the Best Time to Cut Your Grass? Most people grab the lawnmower and mow the grass whenever it’s coolest or most convenient, but if you can time it right, there are optimum periods throughout the day for mowing which will help keep your lawn thick and healthy. Early morning is generally the worst time of day to mow lawn. The grass is still thick with dew which will cause the grass to clump up into wet lumps. 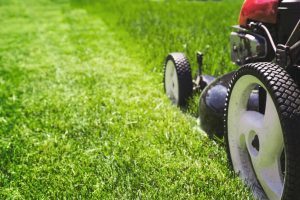 You may be taking advantage of the cool morning, but regularly being forced to stop and clear the mower blades will lengthen the time you spend in the yard. The cut of the grass also won’t be as smooth and consistent as you would like, and you will likely find that you will need to rake up unsightly clumps of clotted grass thrown out by the lawnmower. The advantage of the cool morning hours are soon negated by the extra time you are forced to spend working in the yard. If any areas of your lawn have diseased grass, then early morning mowing with wet grass and wet blades will create the right conditions to spread it to other areas. As you can see, early morning is not the best time to cut grass. Noon will mean there has been plenty of time for dew to evaporate off, but this still isn’t the ideal time to cut grass. Australian summers can be excessively hot, and with the hot summer sun at its peak, you will not only be working during the hottest part of the day, but you will also be stressing the grass. Photosynthesis and chemical processes are most active in plant life when the sun is at its highest. Retaining moisture at this critical time of the day is of the utmost importance for the health of the lawn. Running a mower over the yard cuts off the tips of the grass and allows for more moisture to be lost through evaporation. The middle of the day is, therefore, not the best time of the day to mow the lawn. Early evening is also not an optimal time for mowing. When grass is cut, it needs time to recover. An early evening mow means there is not enough light left in the day for the lawn to recuperate well enough to cope with the next day of summertime heat and sun. When is the Best Time to Mow Grass? There are two optimal times during the day which are excellent for mowing lawns – mid-morning and late afternoon. Late afternoon is a great time to mow lawn. The temperature is starting to cool down, which means less stress for the grass. However, there is still an even better time for cutting grass. Mid-morning is perfect for cutting grass as there is enough time for the dew to dry out, but the heat of the day hasn’t yet peaked. There is also still enough time for the grass to recover before it is hit with the full heat of midday sun. However, if you have no time or don’t like mowing your lawn then you have the option to install artificial turffor your yard. Premier Grass products designed by local team and they looks so natural. Buffalo artificial grass looks like real and Hollow HydrochillTM grass is the most cool feeling grass ever. If you have a dog then Premier K9TM Antibacterial grass is the best.